A shared love of medieval polyphonic music brought four dancers together to create D’Avant back in 2002. The idea of polyphony permeates the piece, which is as musical as it is choreographic, with Juan Kruz Díaz de Garaio Esnaola, Sidi Larbi Cherkaoui, Luc Dunberry and Damien Jalet doubling up as singers and dancers. But it goes deeper than that. Just as medieval polyphony implies a certain independence of voice, its vocal lines layered and overlapped into a loose weave of open intervals that sounds strikingly different from the tight- knit textures of classical harmony, so the four dancers weave loosely through this work and around each other, sometimes knotting into a tussle or a tango, yes, but always unravelling again so that we sense their separateness; ultimately, their solitude. The clang of flesh against symbol is palpably painful. Medieval polyphonic chant is strongly reminiscent of the church, and male voices, and if D’Avant has rightly been seen as an exploration of the brutalities and vulnerabilities of male bonding, for me its stronger (or at least more interesting) theme is religion. 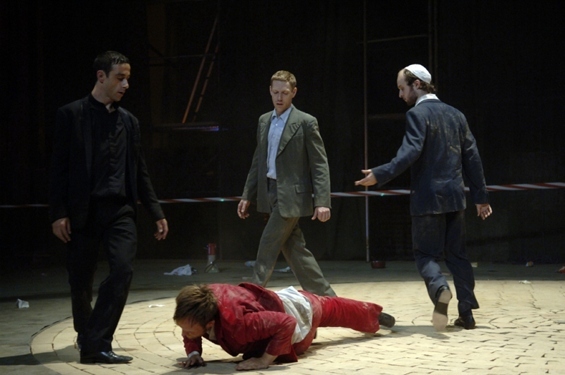 Cherkaoui begins with hands outstretched like a redeeming Christ, swivelling gently like a scarecrow or weathervane in the wind. Beneath his suit, he is indeed on a cross: a rod for his back, another threaded through his sleeves. The other men carry him (their cross to bear) to a rope pulley and hoist him high. A bell tolls – for whom? – as he sways like a human clapper, a crucifix strung up in a church tower. The clang of flesh against symbol – a repeated device in this work – is palpably painful. Later, the guys cluster into a rag- tag religious rally, waving flags and placards while chucking around paraphernalia: pamphlets, wigs, veils, relics. Needless to say, it descends into violence, with cans hurled like grenades, bags of rubbish exploding in the air, the men chasing each other like snipers. Even the most modern, secular scene, in which they form a boy-band to sing 1980s power ballad “Total Eclipse of the Heart”, ends on an oddly religious note: they turn into hero-worshipping fans, screaming with adoration then catching themselves short, first fired with devotion then stricken by doubt. The boy-band number is one of many non-sequiturs: the scenes are more strung together than sequenced, relying on cumulative effect rather than internal logic. Again, this feels truer to the distinct modes and moods of polyphonic music than to the through-composed, all-encompassing structures of tonal harmony. It does, of course, mean that you need to find your own threads through the material. Me – I’m sticking to religion. Sure, a soccer match with a human body (Damien Jalet) as the ball is a man’s game, a tango with hands clasped but bodies held at arm’s length is a man’s tango. Yet I wonder if, by avoiding gender difference, this cast might also bring out more common human imagery: the football as the casually brutalised pawn in a cult of power; the tango as an embodiment of the distance between people who remain, nevertheless, in touch with each other. The closing scenes return us to religion. From the rosette of bricks that forms the floor (credit to Thomas Schenk for his marvellously effective bricks-and- scaffolding set), Dunberry builds up a spiral stairway for the others to step up, as if aspiring towards an imaginary plane. Jalet poses as a manneken pis, passing water continuously as if it were the very stream of life. Esnaola processes forward, transforming from the guise of a pilgrim, to a bride, to a widow, to a corpse; and is laid to rest in a stony grave. A fitting end to a work that has touched, without reverence or sanctimony, on the human bricks from which religion is built: suffering, beauty, brutality; passion and penitence; corporality, morality. Ultimately, mortality.